Seems to me that there are ample threats and inducement for Jim, as was outlined previously. If he wants his day in court, Greg is looking at a much longer sentence. Jim is fully away from this with whatever the Judge decides, rather than the prosecutor. I said I woukld apologize if Jim had to accept a plea to minimize his son's exposure, so I DO APOLOGIZE. Sounds pretty underhanded by the US to get a conviction. What ever hapened to having your day in Court? Who's the victim here? 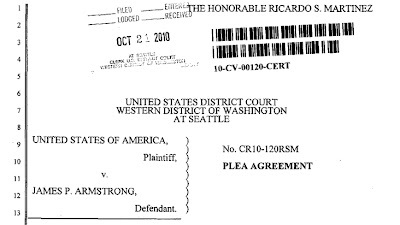 Is it Greg Armstrong, who received more lenient treatment in his plea agreement than he may have expected to receive had he been found guilty at trial? 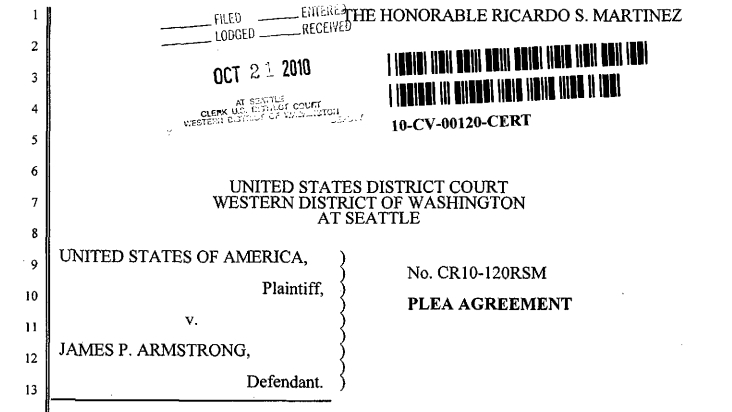 Or is it Jim Armstrong, who agreed to plead guilty to the offences outlined in the original indictment, and that he admitted to according to the arrest report? There are lots of reasons for plea bargains, and lots of motivations. For the prosecution, as described in the Agreements, they get to save money ("permitting the court to allocate its resources efficiently."). Had either Jim or Greg chosen to go to trial, that motivation for the prosecutor would have been removed; thus the Agreement depended on both Jim and Greg agreeing to pleas. It is probably in Jim's interest to imply (he can't come straight out and say so before sentencing) that his guilty plea was entered into to save his son. That may help with his public image in Canada, and with the CCA and their partners who will decide whether he continues as a carded athlete. But there is nothing in the original charges, or the pleas, that indicates that Jim was anything other than guilty of assisting in the distribution of the fake pills on this one occasion and by implication on many others. We don't know what motivated Jim's guilty plea beyond the fact that he was caught red-handed doing what he was accused of doing. By pleading guilty he avoids a costly defence at trial that, according to the Agreement, may have considered actions beyond those described in the plea. He avoids the risk that a guilty verdict after trial could and probably would mean more severe punishment than included in the plea. And by agreeing not to go to trial he allows Greg also to benefit from also not going to trial. You can argue that knowing that Greg's favourable Agreement was conditional on Jim also accepting an Agreement made it difficult for Jim to choose to go to trial. If it also made him admit guilt when he was not guilty, then Jim is a victim. The benefit of the pleas may be greater for Greg than Jim, but both benefit if indeed they are guilty, in which case neither is a victim. The kids who purchased unregulated pills at the clubs from Greg, however, did not know they were fakes, and were not allowed to make an informed judgement of the risks of using them. It would seem we will have to wait until after January for the answer. My bet is that the risk was simply too great for Greg. Look at the obvious; Jim is charged the same as Greg, yet is not facing anything nearly as harsh as Greg......doesn't that suggest that this is to Greg's benefit? I agree. This agreement has to have benefitted Greg. Definitely benefits Greg - does it disadvantage Jim? Sure does if he was not involved and had to bite hard to get it through. But everyone is guessing until Armstrong con respond. He will answer, as he can. He has never dodged an issue, even when he has been beat up here before. And yes, I AM A FAN. WHO CARES WHO GETS THE ADVANTAGE? GOING TO TRIAL MADE NO SENSE. TALK ABOUT A RAILROAD JOB. SO MUCH FOR REAL JUSTICE IN THE WORLD'S LARGEST DEMOCRACY. When the story first broke and the officer arrested Jim, he admitted what he was doing was wrong. There is no wrong doing in transporting LEGAL drugs to and from the US. This to me means he knew something was not legal in the package or the transportation of said package. The old adage of innocent until proven guilty is true, Jim plead guilty. Let's move on and stop trying to defend him. Perhaps the agent was wrong? Jim did have the contraband in his possession, but what did he know? His present admission seems to be under pressure. Let's wait for his statement.